Future space missions may send dozens of rug-like robots fluttering down to the surface of alien worlds, taking much of the risk out of planetary exploration. Researchers are developing flat, blanket-size landers that could be delivered en masse to worlds such as Mars or the Jupiter moon Europa. The approach represents a radical departure from the surface-exploration status quo, which generally launches single-shot, big-ticket landers or rovers that cost hundreds of millions of dollars to design and build. Hemmati and his team got a $100,000 grant from NIAC last year to develop the "flat lander" concept. The current vision calls for dozens of sensor-loaded sheets — each about 3 feet long by 3 feet wide (1 meter by 1 meter), but less than 0.4 inches (1 centimeter) thick — to be toted to another planet or moon by a mother ship. 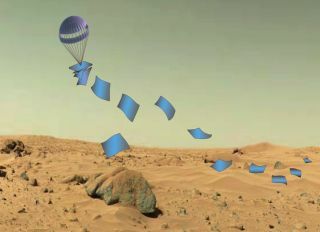 Each sheet would touch down at a different location, without the need for complicated and expensive landing systems such as the "sky crane" that dropped NASA's Curiosity rover onto the surface of Mars in August 2012, researchers say. "These landers should be capable of passive landings, avoiding the costly, complex use of rockets, radar and associated structure and control systems," Hemmati and his colleagues write in a description of the project on the NIAC website. The loss of a few landers on any particular mission would not be a big deal anyway, Hemmati said. "They don't all have to survive; we have dozens of them," he said. "Even if half of them make it, it's still good. We'll be happy." Recent advances in thin, flexible electronics would allow these solar-powered sheets to gather a great deal of data on the surface of an alien world. For example, each one could carry tiny cameras, spectrometers and environmental monitoring gear, Hemmati said. The landers would beam their data up to an orbiter or passing flyby craft, which would relay the information back to Earth. The baseline concept calls for the landers to be stationary. But some mobility could be achieved by equipping them with tiny legs, or with actuators that could shape the sheets into spheres when desired, allowing them to be driven by the wind on breezy worlds such as Mars. Mars is a viable destination for a fleet of flat landers, Hemmati said, adding that the robots could be sent to places heretofore deemed too risky and rugged to explore, such as the huge canyon system Valles Marineris. More far-flung celestial objects — such as Europa and the Saturn moon Enceladus, which are both thought to possess subsurface oceans of liquid water — are possible targets as well. In fact, a flat-lander delivery to Europa would make a lot of sense, Hemmati said, since NASA is developing a potential flyby mission to the moon called the Europa Clipper. "These two-dimensional landers could be nice as a pathfinder," Hemmati said. Because Europa and Enceladus are so far from the sun, any flat landers on their surface would probably need more than just solar energy to keep operating. But that power could probably be beamed down to them by an overhead spacecraft, which would need to fly by regularly to relay data home anyway, Hemmati said. While such long-distance power beaming sounds like a sci-fi dream, the concept is sound and has been demonstrated here on Earth, Hemmati said. "Actually, we've had funding from DARPA [the U.S. Defense Advanced Research Projects Agency] for tactical applications to do laser power beaming to remote areas in Iraq, for example," he said. "It's feasible."